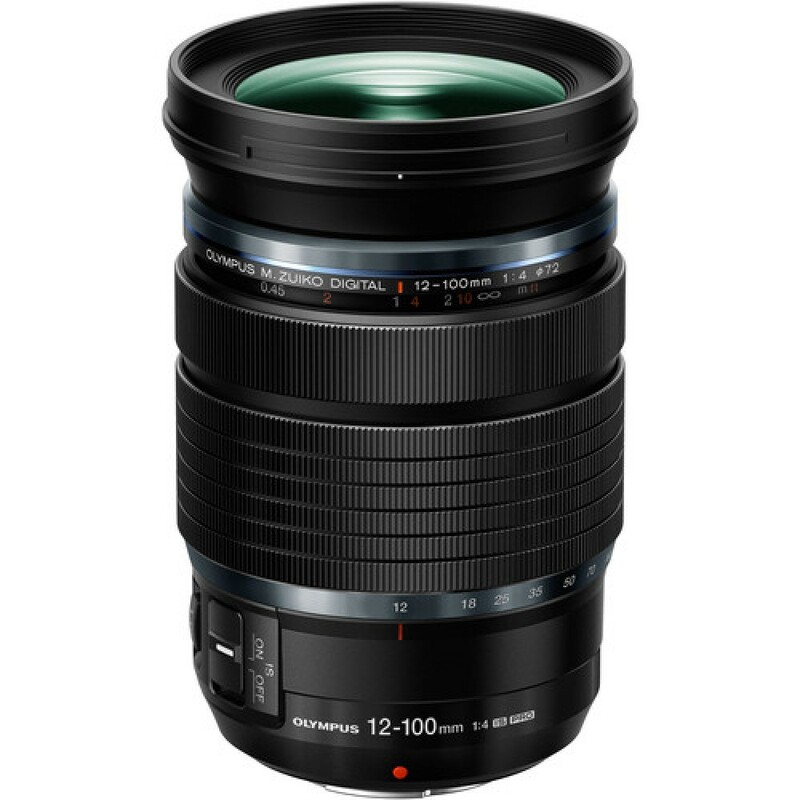 Spanning an impressive wide to telephoto range, the M.Zuiko Digital ED 12-100mm f/4 IS PRO Lens from Olympus is a 24-200mm equivalent zoom designed for Micro Four Thirds mirrorless cameras. Characterized by its f/4 constant maximum aperture, this lens offers consistent performance throughout the zoom range to suit both stills and video shooting. Its optical design incorporates a slew of low dispersion and aspherical elements in order to reduce both chromatic and spherical aberrations, and both a ZERO coating and a Z Coating Nano have been applied to greatly reduce lens flare and ghosting for improved contrast. Benefiting handling the expansive zoom range is five-axis Sync IS, which compensates for up to 6.5 stops of camera shake when paired with select OM-D or PEN camera bodies. A Movie & Stills Compatible (MSC) high-speed imager AF system provides quick, accurate, and quiet focusing performance well-suited to both photo and video applications, and a manual focus clutch permits fast changing to MF for more precise control. Additionally, a lens function button is featured on the side of the barrel for direct settings adjustment, and the lens also features a weather-sealed construction for use in trying environmental conditions. Spanning a wide-angle to telephoto range, this 12-100mm zoom is designed for Micro Four Thirds mirrorless cameras and provides a 24-200mm equivalent focal length range. Constant f/4 maximum aperture provides consistent illumination throughout the zoom range to benefit both stills and video applications. One double-sided aspherical element and three aspherical elements are featured in the optical design to limit spherical aberrations for improved sharpness with reduced distortion. Additionally, five extra-low dispersion elements, two Super HR (high-refractive index) elements, and one HR element are also used to control chromatic aberrations and color fringing for greater clarity and color fidelity. Both a ZERO Coating and a Z Coating Nano are applied to individual lens elements to noticeable reduce surface reflections and prevent lens flare and ghosting for improved contrast and color neutrality in strong lighting conditions. Lens-based image stabilization helps to minimize the appearance of camera shake to benefit shooting handheld with this lens in difficult lighting conditions. Additionally, this lens supports Synchronized IS, which pairs the optical IS system with select Olympus cameras' 5-axis sensor-shift image stabilization to control up to 6.5 stops of camera shake. A MSC autofocus system provides quick, quiet, and precise focusing performance to benefit both still photo shooting and movie recording. Additionally, an MF clutch is used for fast changing to manual focus for more precise control. Weather-sealed construction guards the lens against dust and moisture for working in harsh environments. Circular seven-blade diaphragm contributes to a pleasing bokeh quality.